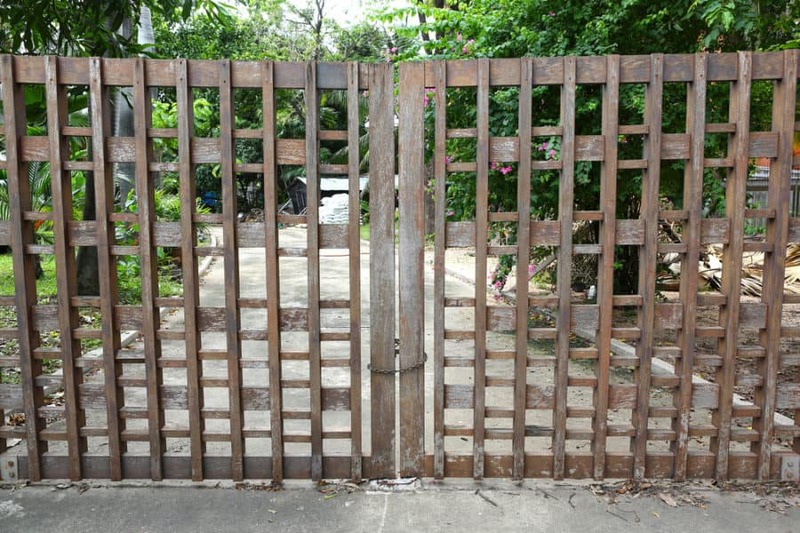 A gate can provide privacy, security, and dress up the look of your house or property. Here are 25 fence gate ideas that will inspire you to create a unique gate that will stand out from the rest. 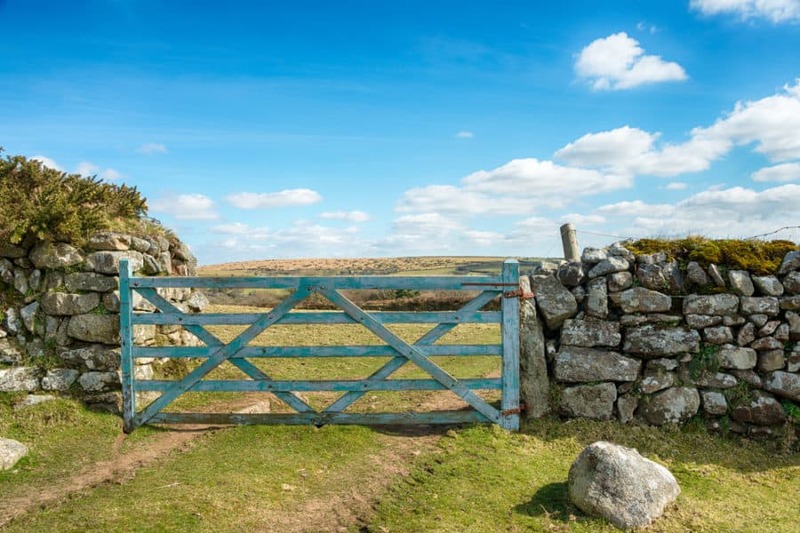 When building your own gate, pay extra attention to the supports, the posts, the hinges, and which way you want your gate to open. 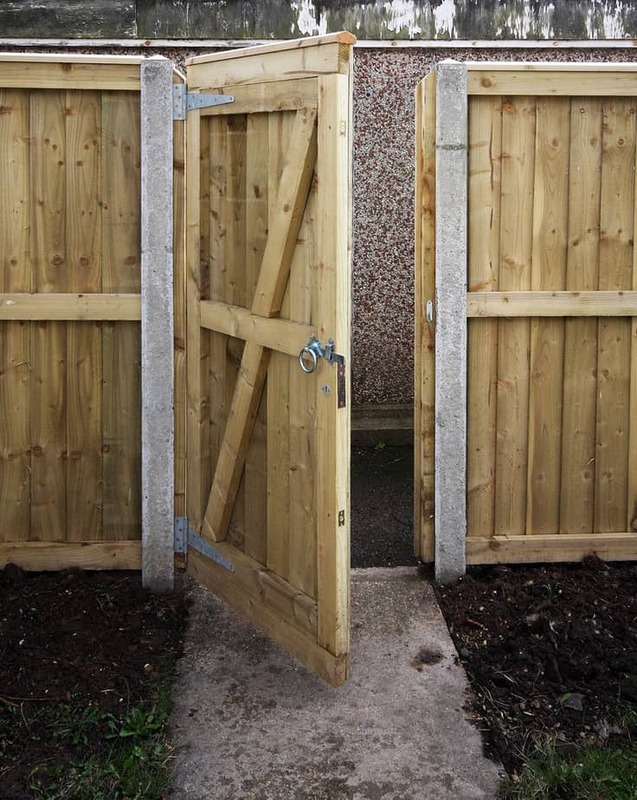 There seems to be almost a 50% chance that first-time gate builders will install part of the gate backward. You don’t have to build your own gate to be part of the design process. 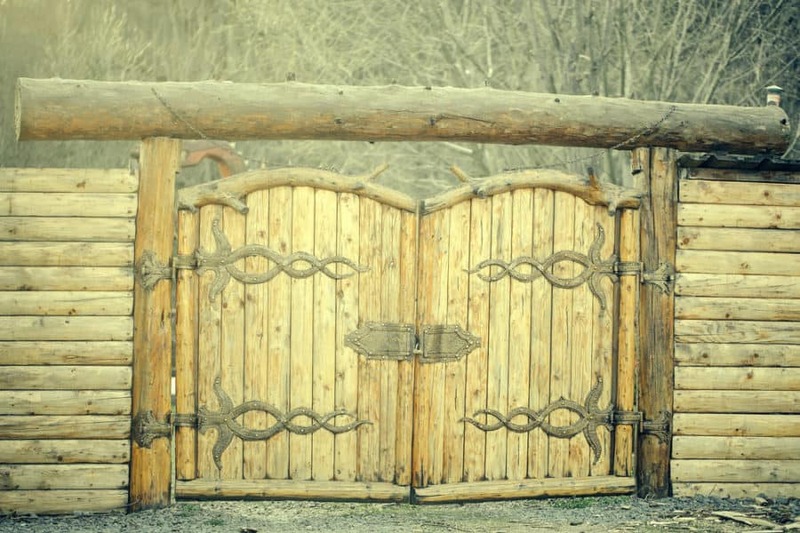 Some details that can make a gate unique include the material, stain, color, and design accents. Color can be a great way to customize the look of your gate. Different colors can even have an affect on your mood. Fancy latches and hinges are also a great way to update the look of your gate. 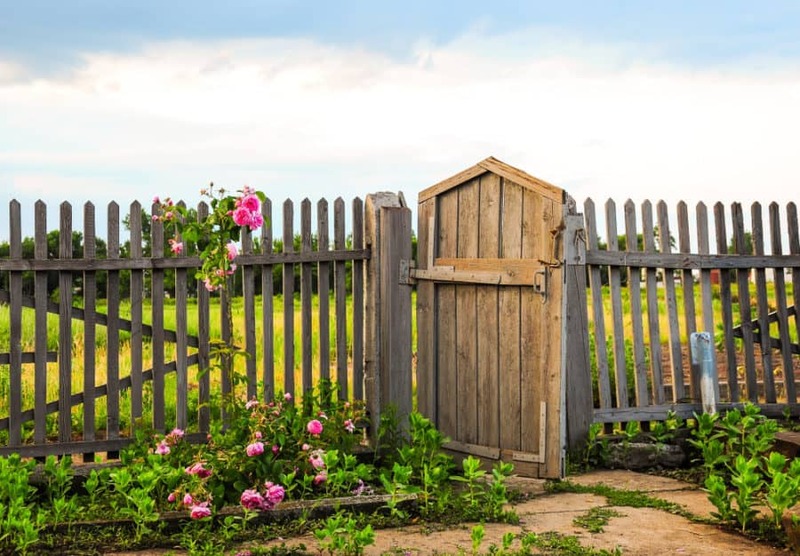 A new or updated fence and gate will not only make your house look great, but it improves home security. Your gate creates one more barrier to entry. It is also a great way to create boundaries for children and pets. 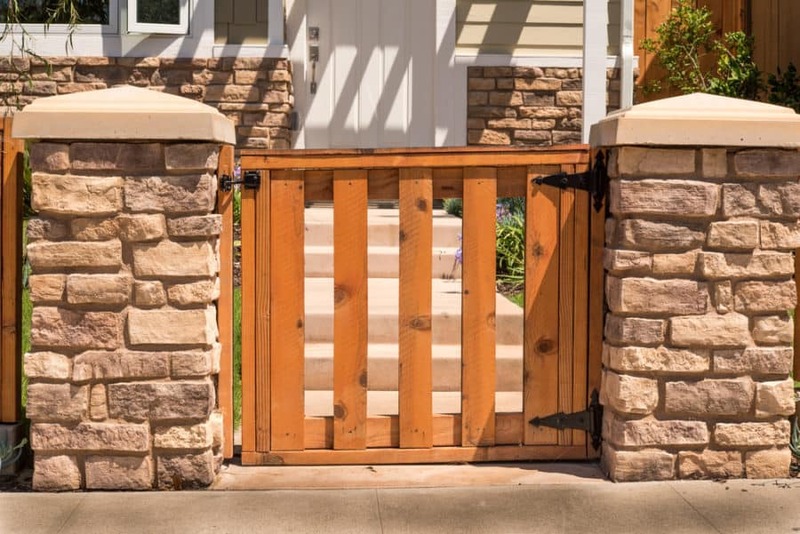 No matter what your reason for building a new gate, hopefully, these ideas will help provide inspiration. 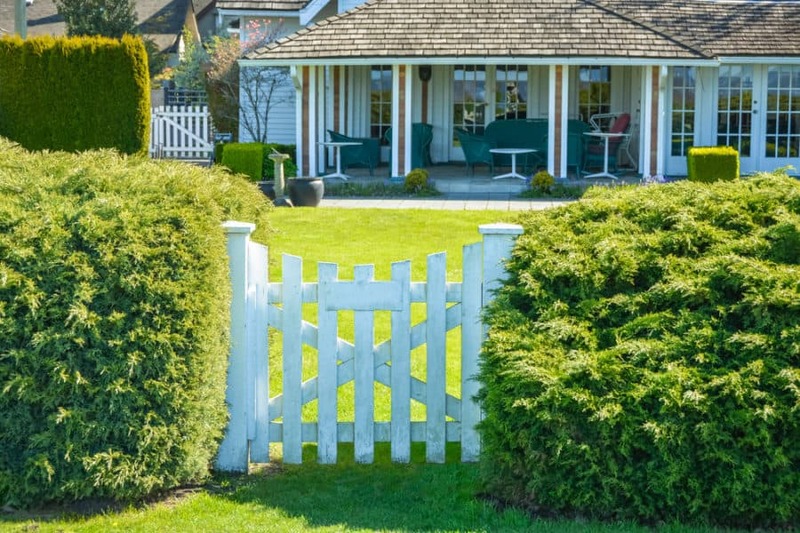 This traditional white picket fence gate reminds us of the English countryside or maybe a trip to grandma’s house. Nothing says home like a white picket fence. This one can easily be duplicated with white pickets, cross boards and a couple of fancy posts. The shrubs are optional. Here is another white picket gate. This one has the pickets trimmed to an arch shape and z pattern supports. It comes complete with a fancy looped gate handle. It is supported by brown posts with an interesting brown wood fence design. This just goes to show that any gate and fence can be combined to create a unique entrance to the yard. Here is a beautiful ornate white wood gateway. The gate itself is relatively simple with a u-shape curved top, x supports and straight pickets. Then it is set into arched posts and attached to a pergola shaped frame. The fence has a square lattice pattern. To top it off this elegant gate and fence are painted white and surrounded by colorful flowers and vines. Vinyl fences have come along way. These fences are sun and weather resistant and can be brought back to life with a simple spray of the house. They last much longer than traditional wood fences and look as good or better. This design is a straightforward up and down picket in a railed frame. Here is a fancier vinyl option. This is a double gate with up and down pickets on a z patterned support frame. It has a large decorative latch and handle. The posts are large and detailed. They really set off the fence in this beautiful flowered yard and garden. 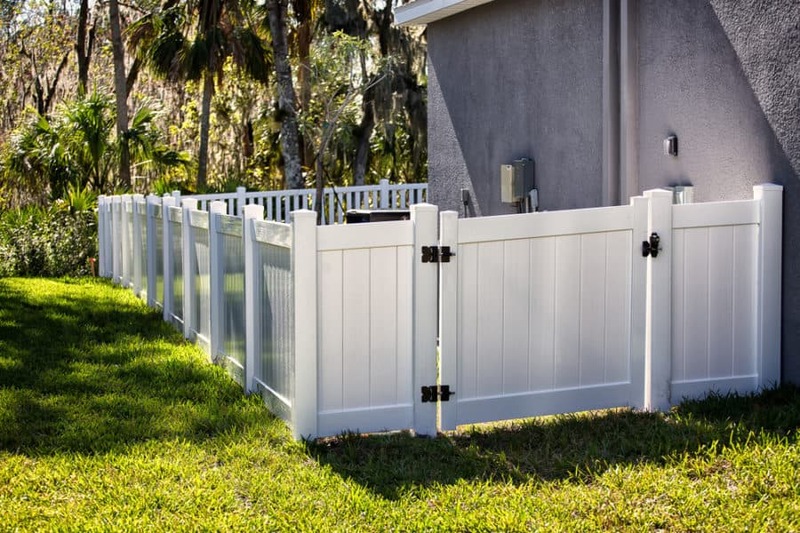 This vinyl gate and fence uses touching slats between the frame and posts creating a privacy fence. This is the perfect option to block off unsightly utility areas or to contain pets. 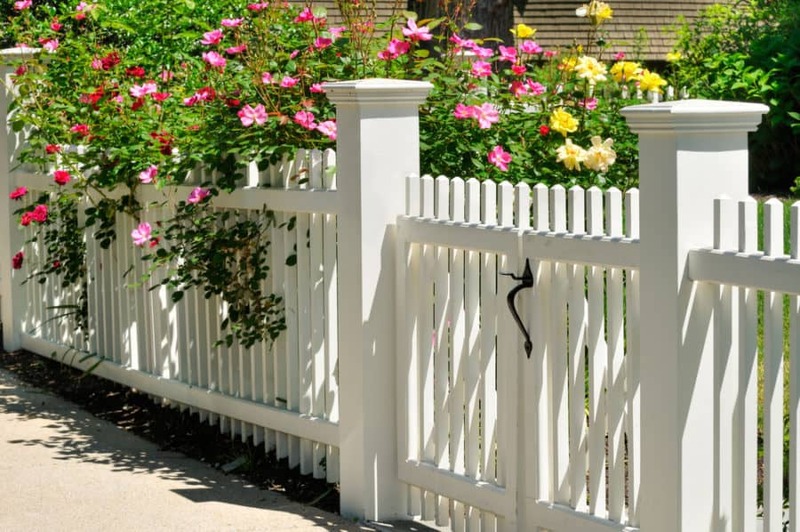 The black hinges and latch against the white make the fence standout and looks great in a well groomed yard. Here is a rustic looking gate made from natural poles and branches. Even the z shaped supports are natural poles. It has metal hinges and a staggered top. 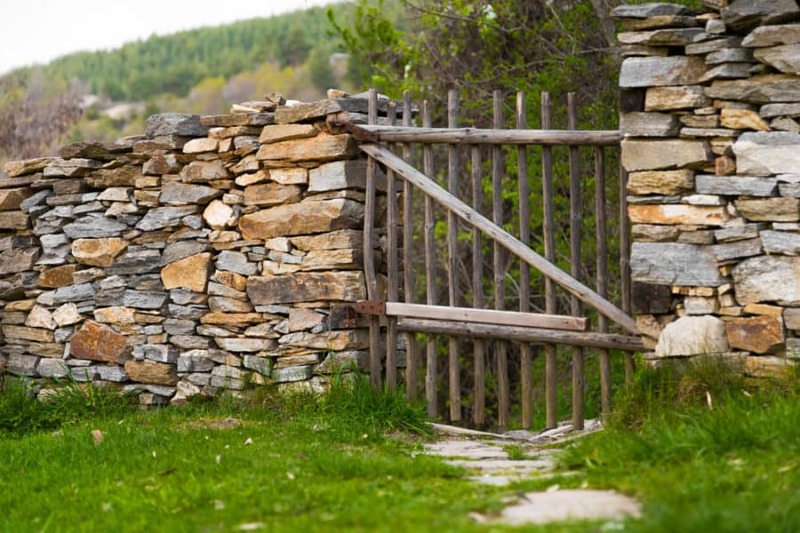 The gate is set in a stacked stone fence giving it that rustic fairytale look. This just goes to show that fences can be made with whatever you have to work with. This is a beautiful solid wood gate. The rectangular frame forms a point at the top creating a unique twist on the typical arched fence gate. The posts are sturdy, and it really offsets the old natural wood pickets in the fence. This gate style can be finished with a built-in sliding wood latch or a fancy brass or metal latch. Finding a gate like this would be an awesome thrift store or antique shop find. This is a vintage saloon door gate swinging gate with a stylized wood pattern and metal bars. The chipped paint, rust on the hinges, and remnants of colors of the past only add to its character and charm. The simple design of the slatted wood gate not only makes building it easy, but it is strong and durable. Create a wooden frame, then add slats with a top and bottom support board. Mount it to fence boards and add a nice matching black latch and hinges. The stone pillars only add to the strong appearance of this gate and fence. Here is a unique and functional design. First it is a very strong privacy fence with solid wooden boards and black metal supports and frames. If you look closer, you will notice that the width of the slats is staggered and there is slight design element cut into the top. There is a white board on top of the pointed arch. 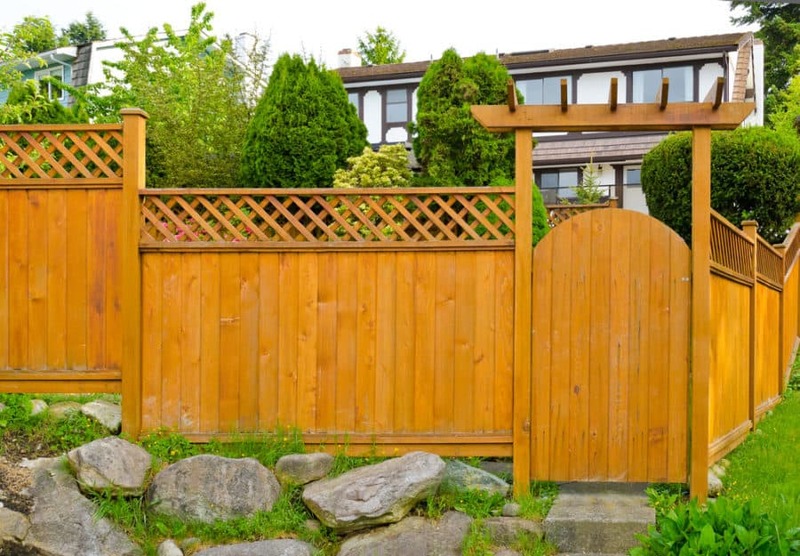 This is a solid wooden privacy gate and fence made from wooden pickets in a rectangular frame. It has a simple cross support and an extra diagonal support. It’s set off with simple silver hinges and a looped latch. This will keep your yard or garden secure from prying eyes and wandering people and animals. This is a decorative arched gate made with wooden slats. What sets the design off is that it is in a fancy pergola frame with decorative beams on top. The fence itself is a stained lattice fence that adds to the overall look of the landscape design with its offset heights and rock accents. Here is a large double gate made from painted brown wood and iron accents. This stately gate opens inside brick pillars giving it the look of an impenetrable fortress. This is a gate that will make trespassers think twice. This design could be a great option if you have a very large fence and need a large gate opening. Here is a unique design that would be perfect for a mountain home, lake house, or ranch. This gate is made of natural timber slats and logs. The arch and posts are made from large logs and there are decorative accents continuing from the hinges. If log cabin living is for you, this gate may be an option. Here is a gate design that could be used for a driveway or large fence opening. The double fence is made from a wooden frame interwoven with smaller pieces of wood creating an intricate checkered design. This gate is secured with a wrap around chain and padlock, but a fancy latch could be used to really dress it up. A driveway gate is a necessity out in rural areas. Here is an example of a large driveway gate made from natural logs put in an a-frame with slats going across it. This would be a great addition to any farm or cabin area, and it’s really set off by the large log gate posts. Here is another variation of the farm fence gate made from wooden slats. It is a simple design with a rectangular frame and vertical slats. Diagonal support slats create the a-frame look. It is set in sturdy support posts with metal hinges and a metal latch. 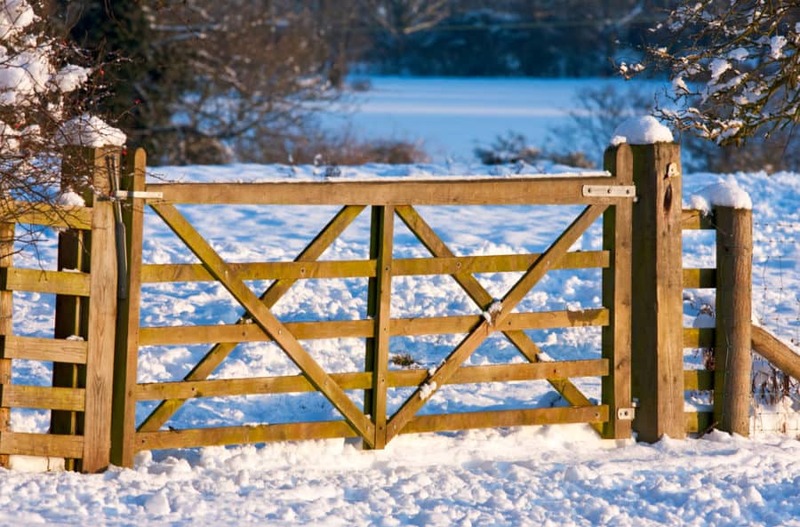 This is a simple and useful gate design. The snow is optional. Here is a simple square gate made from a square frame with diagonal supports. This double gate is mounted on a post on each side. This simple design would look great on any ranch, horse corral, or your backyard. Even without the sunset this gate is a beauty. A rounded top and slats cut in rounded shapes create the perfect design for this colorful red gate. Get out the woodworking tools and let your imagination run wild. Decorative gate patterns assembled and painted will make your gate stand out from the rest. 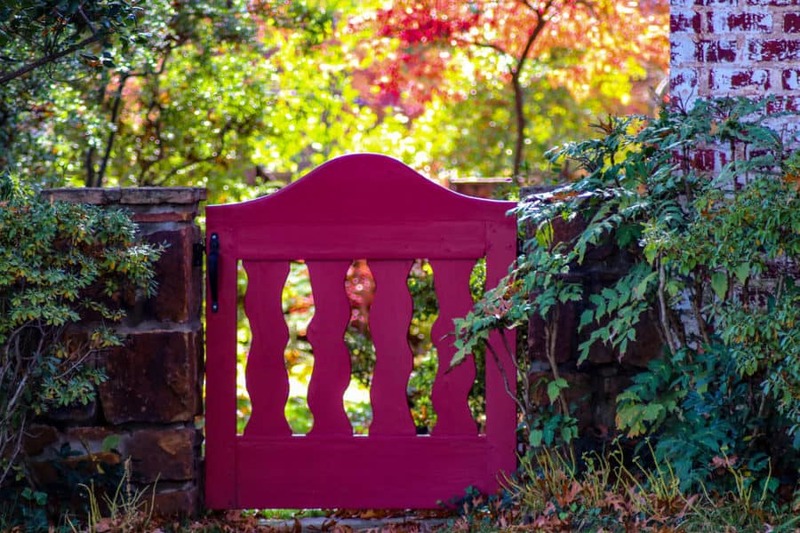 If fancy woodworking isn’t your thing, you can still have a unique look to your yard and gate just by adding a splash of color. 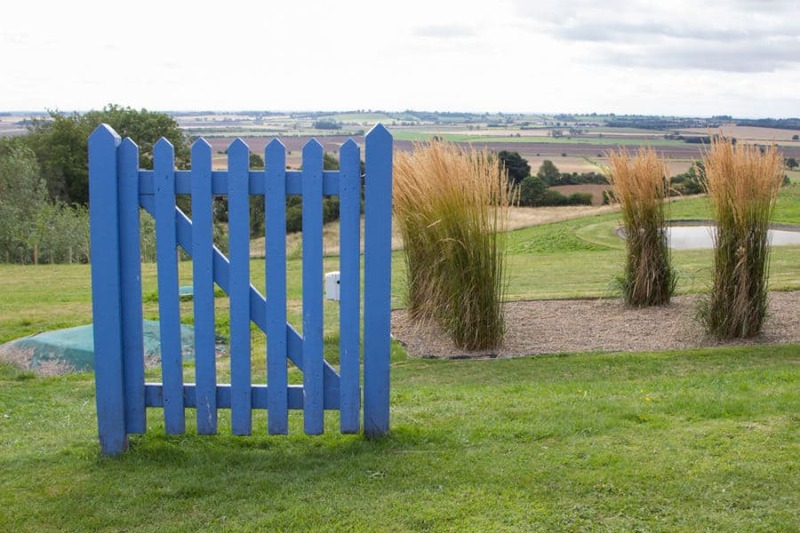 This simple picket gate really stands out with a nice coat of blue paint. 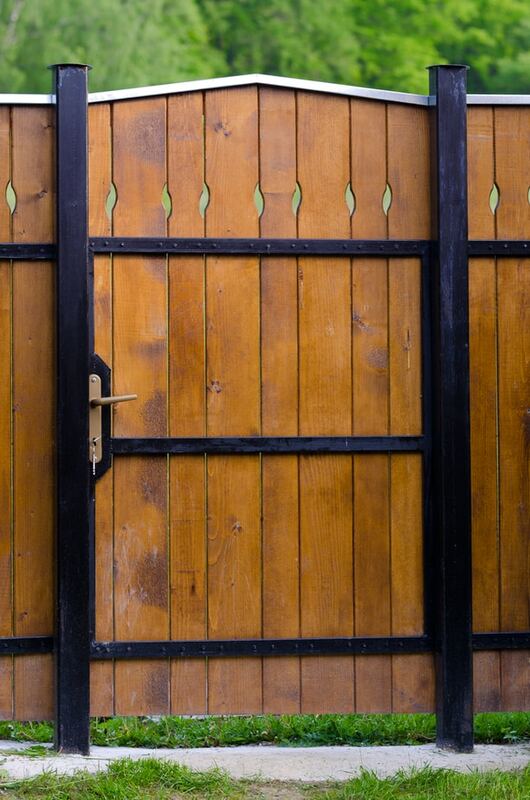 Paint can make an old house look new and can breathe new life into your old or new gate. If you can’t go to the beach, bring the beach to you. 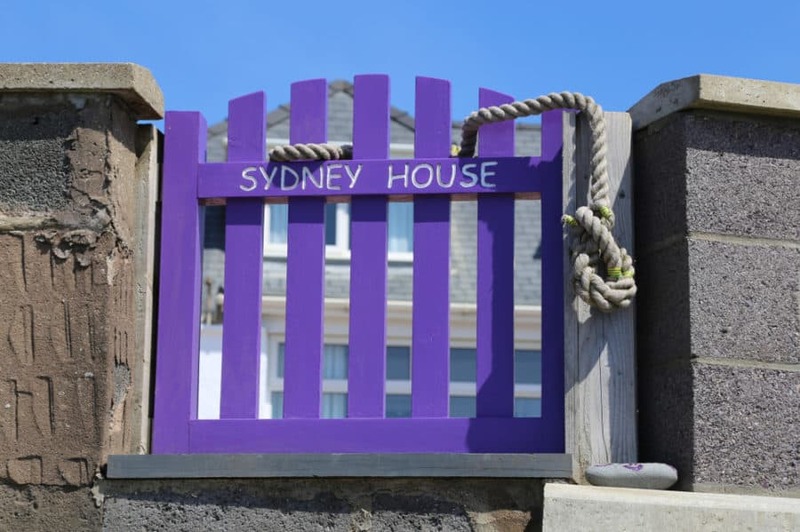 Here is an example of a simple picket gate painted a pretty purple, monogrammed with the homes name, and adorned with a rope latch for that beach look. Colors and accessories can help your gate look unique and add your personalized touch. 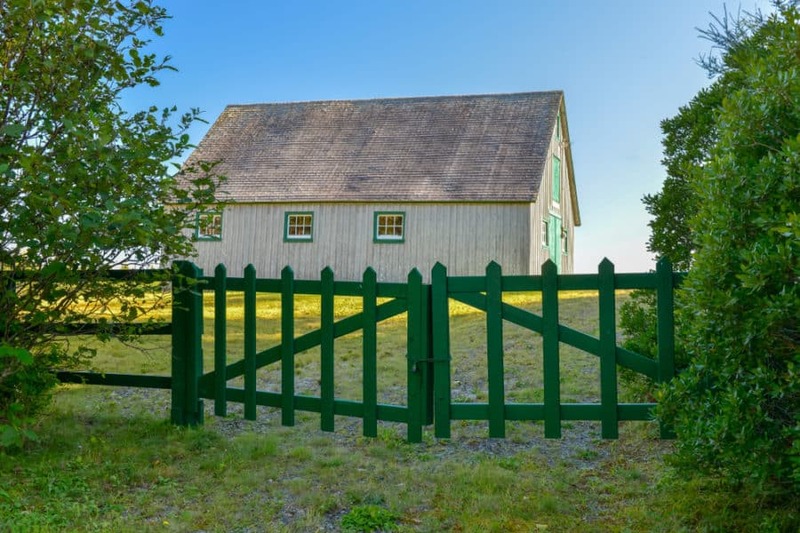 Here’s a splash of color if you live in Ireland, or if you just want a nice wooden farm, ranch, or driveway gate. This one is set in a stone fence, but you can use this gate design with a simple wooden fence or let your imagination run wild. It’s a simple slatted frame with diagonal supports painted a rustic blue-green color. Whether you are creating a new iron fence gate or already have one that needs dressing up, this is a great example of customizing a gate to make it your own. This red, white, and blue lone star state gate just screams we live in and love Texas. This is great example of how a little paint and imagination can go a long way. Green fields, green barns, and green gates make us think of the country and life on the farm. A splash of green paint can breathe new life into your old gate and bring a splash of country to the city. 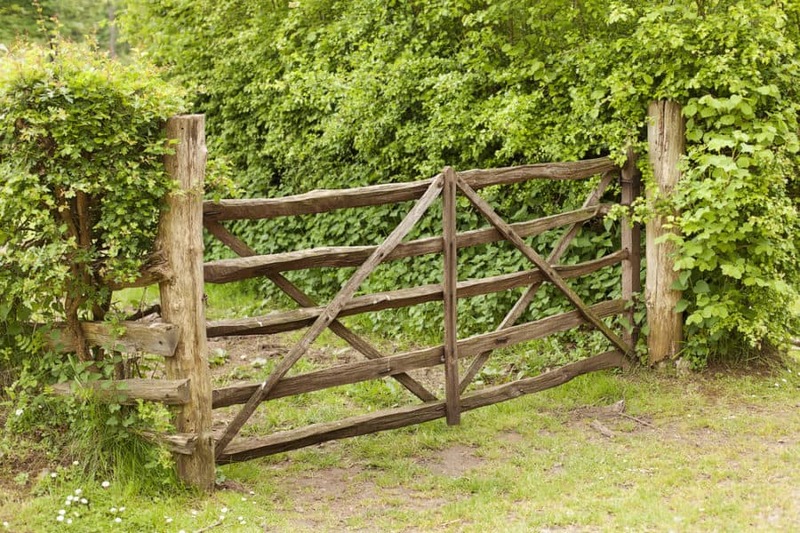 This traditional slatted double gate with diagonal supports is a great example of this. We hope some of the fence gate ideas above have given you a bit of inspiration to create a new gate that fits your individual lifestyle. Added privacy, security, and improved value can all be benefits of a new fence and gate system. 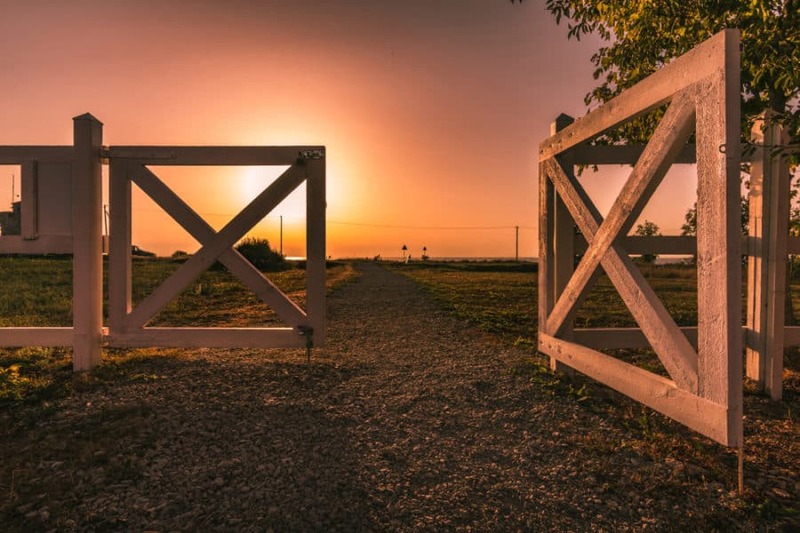 It doesn’t matter if you have a large backyard, a small front yard, live in the city, or the country having a unique gate can make your home standout and express your unique personality.